If you are looking for ways to improve the nutritional value of food when you cook, then cooking with coconut oil is definitely something worth thinking about. Some people don’t like using coconut oil for cooking because we live in a climate where most fats are given a bad name. But, is that true with coconut oil? Some years ago coconut oil received a lot of unnecessary bad press, mainly due to the saturated fats it contains. However, many recent studies have shown that there are many health benefits to coconut oil and that not all saturated fats are equal. I have already discussed these health benefits in my previous article about the many health benefits of coconut oil. So, rather than looking at the many ways coconut oil can benefit your health, let’s look at the many ways you can get these wonderful benefits by adding coconut oil into your diet. Because it looks different to ‘traditional’ cooking oils, you may be hesitant to start using it at first. But don’t worry as it is very easy to use. The first thing that most people notice about coconut oil is that it is solid and white in the jar. This is completely normal for unrefined and refined coconut oil and the reason for this is because of the saturated fats it contains. The oil will start to melt when it is heated up to over 76°F (24°C). It’s worth noting that another kind of coconut oil, fractionated coconut oil, is liquid at room temperature. Coconut oil is perfect for all kinds of culinary uses. You can use it for shallow frying, deep frying and baking. In fact, it can be used in almost all recipes in place of butter, oils, and other fats. One great thing about coconut oil when frying is that it has a smoking point of around 350°F (187°C), meaning that it doesn’t oxidize easily. Gently melt coconut oil until it has just liquefied (or just place the coconut oil jar in a glass bowl with hot water), pour it into small silicone ice cube trays and let it cool down. When you need to use some coconut oil in a recipe, you can easily pop out a small cube of oil. If you live in a warm climate, then you could keep the cube tray in the refrigerator. Some people like to keep coconut oil in a warmer place, for example, above the stove. This means that it is always easy to use. Some chefs like to whip up coconut oil and keep it in a jar, that way you can easily scoop it out when needed. 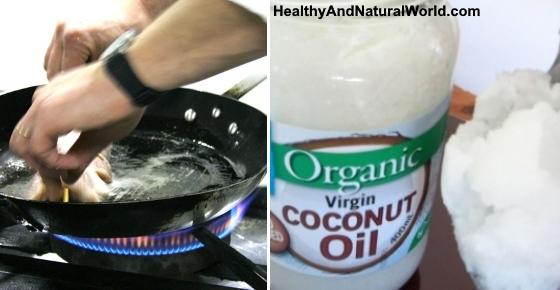 Once you start using coconut oil for cooking, you will begin to love it! Not only does it have a nice taste, but you get all the health benefits of coconut oil also. Coconut oil contains about 90% saturated fat, and while this may seem like a negative, it’s good to remember that not all fats are created equal. Some fats are better than others. So, what about coconut oil? The saturated fats in virgin coconut oil are abundant in lauric acid. This fatty acid has been proven to increase HDL, the good cholesterol, in the blood1. Other studies suggest that lauric acid helps fight off infections2. Coconut oil contains medium-chain triglycerides (MCT). The body very quickly turns these fatty acids into energy, rather than storing them as fat for energy release later. So, it can aid in weight loss (you can read more about it in my article on how to use coconut oil to lose weight). Coconut oil is more resistant to oxidation at high temperatures. This is important because studies show that fats can be harmful to health when they oxidize during cooking3. Coconut oil has approximately the same amount calories as other oils. Too much coconut oil will increase your calorie intake. Unrefined coconut oil can leave a taste and smell of coconut in food (which some people dislike). Later in the article, I’ll talk about how to solve that issue. Hopefully, you are now excited about trying to incorporate more coconut oil into your diet. How can you start using coconut oil on a daily basis? In coffee. Add a teaspoon or two of coconut oil to your hot drink such as coffee or tea. To emulsify well the oil in the drink you can pour a cup of your favorite coffee in a blender and then add the coconut oil and blend together. Pour, and enjoy. In smoothies. Add about a tablespoon of coconut oil when blending your smoothie. Before adding to the blender, gently heat the coconut oil until it has just melted (or just place the coconut oil jar in a glass bowl with hot water). That way you will avoid lumps in your smoothies. You will add a delicious tropical taste of coconut to your smoothie. Stir fry cooking. Because of its high smoke point and concentration of saturated fats, it is an excellent choice for stir fry cooking. Many stir fry dishes, like Thai cooking, use coconut oil anyway. Popcorn. To give homemade popcorn a delicious taste, substitute cooking oil with coconut oil. Just don’t let the oil get too hot, or the popcorn may turn chewy. Baking. Coconut oil can be substituted for butter and vegetable oils in most baking recipes. Frying. Suitable for all types of frying. Homemade coconut mayonnaise. Replace the oil in the recipe with ½ the amount of coconut oil and ½ the amount of olive oil. Adding coconut oil to white rice significantly reduces its calorie count. Read more about it in my article about how adding coconut oil to white rice makes it 50% healthier. Remember, when you incorporate coconut oil into your diet, you are not just substituting it for other oils; you are actually adding nutritional value to your food. Which Kind of Coconut Oil to Use – Unrefined, Refined or Fractionated? When you start shopping for coconut oil, you will find that there are 3 different kinds: unrefined, refined and fractionated coconut oils. To make sure that you get the health benefits and other advantages that you are expecting, it’s good to know the difference between them. Refined coconut oil has been bleached to remove impurities, and deodorized using high heat to remove its distinctive odor and flavor. On the other hand, unrefined coconut oil (often called “virgin coconut oil”, “extra virgin coconut oil” or “cold pressed coconut oil”) does not require bleaching and isn’t exposed to high heat levels. Therefore it retains its distinct flavor and odor of coconut. Unrefined coconut oil has the most overall health benefits as it is less processed. However, when used in cooking it leaves behind a coconut aftertaste and scent, which not everyone enjoys. It also burns at a lower temperature than refined coconut oil. So, it is not ideal for everyone, especially when frying at high temperatures. For cooking, especially frying, the smoke point or refined coconut oil is around 450°F (232 °C), which is 100°F higher than unrefined virgin coconut oil. It is also tasteless and odorless. Therefore, if you don’t like your food having a hint of coconut smell or taste, you can use refined coconut oil. Some people, however prefer the taste of cold pressed virgin coconut oil in their food. In this case, and if you don’t exceed the smoke point, virgin coconut oil is the best option for you. If you choose to use refined coconut oil, bear in mind that not all refined coconut oils are alike. Some brands use a chemical distillation process, and some coconut oils are even hydrogenated or partially hydrogenated. These ones should be avoid at all costs. However, there are some quality, non-hydrogenated refined coconut oils that are refined using a natural, chemical-free cleaning process which are fine for consumption. I’ve already written in detail about fractionated coconut oil (FCO) and its uses. This oil is sometimes marketed as ‘liquid coconut oil,’ with the promise that it will stay liquid, even in the refrigerator. However, to make it liquid, most of the lauric acid is removed from it, taking away many of its health benefits. If however convenience in the kitchen is a factor for you and you prefer a liquid form of coconut oil, and you don’t like the scent and taste of virgin coconut oil, then you can use fractionated coconut oil as it is already in liquid form, odorless and tasteless. When cooking with fractionated coconut oil, keep the temperature below 320 °F (160 °C) or its chemical structure will break down and it will smoke. Coconut oil is readily available in most supermarkets and health food stores. One of the easiest ways to buy coconut oil is online. Always make sure that you purchase organic coconut oil (like this one or like this one). The fats in coconut oil can also boost metabolism slightly and increase feelings of fullness compared to other fats. You can make a homemade vapour rub by mixing half a cup of coconut oil with a few drops of eucalyptus and rosemary oils to rub on the chest and throat.